The eighth annual Honk NYC! festival is back, once again celebrating all things brass. For the uninitiated, Honk highlights the legacy and diversity of horn-based music by bringing six days of funky tunes to the people. Though the raucous live performances are the key draw, the festival also includes community events and educational initiatives, which you can read about at Honk's website. For all of you who are interested in Honk but don't know where to start, we've picked five gigs you definitely want to see. A free show is the perfect way to kick off a brass band bonanza. 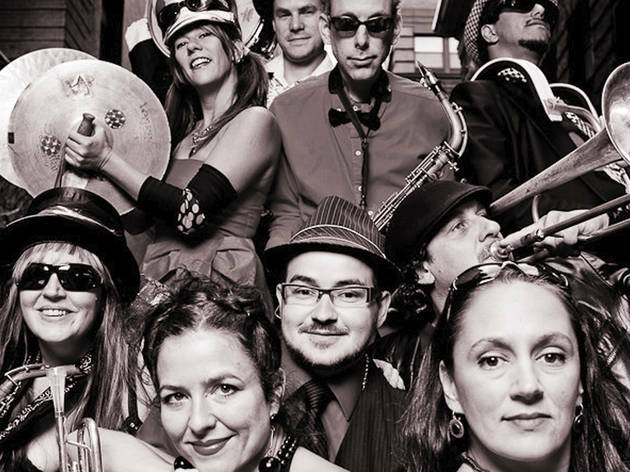 Brooklyn’s Hungry March Band gets things started tonight by bringing their blend of jazz, world music and punk rock to Penn Plaza. The 15-odd member collective puts on an energetic show, so expect to sing and dance along. Mon, Oct 13 at 5:30 pm; 1 Penn Plaza; free. These Honk vets draw inspiration from New Orleans brass bands, and put their own modern French spin on the tradition. It's kind of like history in reverse. Posting up outside Penn Station, they’ll deliver their lively tunes to the masses. It’s another free show, so there’s no reason not to go. Tue, Oct 14 at 5:30 pm; 1 Penn Plaza; free. Trumpter Frank London’s band draws its name from a style of traditional Eastern-European Jewish music, but don’t be fooled into thinking that they’re strictly revivalists. The group blends old-world sounds with more jazzy impulses for a sound uniquely its own. Supporting are the PitchBlak Brass Band and the Raya Brass Band. Wed, Oct 15 at 8 pm; Littlefield; $10–$12; 21+. There’s no better descriptor for Spanglish Fly’s sound than its own tune titled "Latin Soul Stew." The NYC group’s tight, funky tunes are not only sure-fire crowd-pleasers, but compel you to dance along—something that shouldn’t be hard in the spacious Gowanus Ballroom. 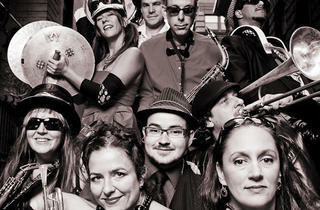 Supporting is the Hungry March Band with its second show of the festival, as well as Underground Horns and Batala NYC. Fri, Oct 17 at 8 pm; Gowanus Ballroom; $10–$15. Kenny Wollesen’s percussion credentials include collaborations with luminaries like John Zorn and David Byrne. His Wollesonic Laboratory engineers new musical instruments, which you can see in the video below, and Sonic Massage will treat us to a performance using the lab’s creations. This free experimental show features support from the Human Jukebox Brass Band and Environmental Encroachment. Sat, Oct 18 at 2 pm; Tompkins Square Park; free.